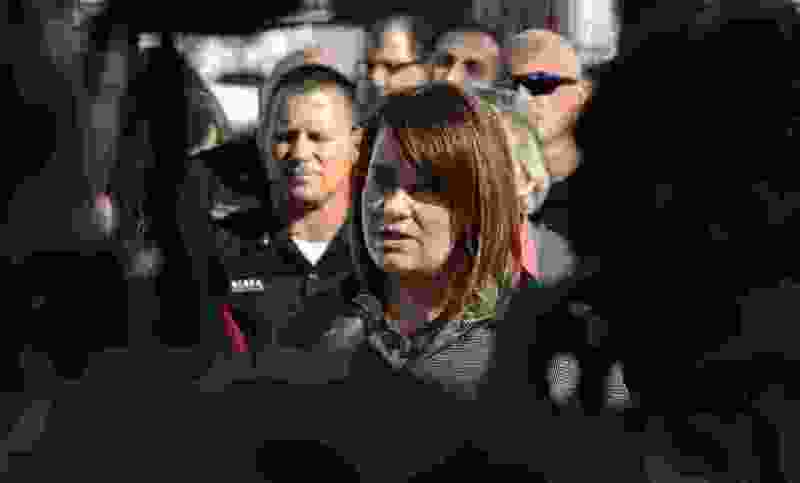 (Steve Griffin | Tribune file photo) South Salt Lake Mayor Cherie Wood talks with the media stating that the two homeless shelter site finalists in their borders don't meet the criteria sought by the county and state during a press conference at Woodrow Wilson Elementary South Salt Lake City, Utah Monday March 13, 2017. South Salt Lake Mayor Cherie Wood was denied a salary increase by a 4-3 vote of the City Council on Wednesday — with the male-dominated no vote prompting one female council member to question whether sexism was a motive. Councilwoman Sharla Bynum tried to tell colleagues she saw the same thing happen in 2014 when a proposed raise for Wood also was rejected. Three men and one woman made up the council majority turning down the raise, while two female members and one male councilman voted for it. The rejection came right after a unanimous vote of the council to reject a pay increase for themselves. Several members said having all city elected officials go without an increase would send a good-faith message to residents, especially in light of a proposed water utility fee. Wood, who has been mayor since 2010, is paid a salary of $81,492 plus benefits. The 6 percent raise proposed Wednesday — and already approved for other full-time city employees — would have brought her up to $86,460. She has had only one salary increase while in office: a 4 percent boost in 2011. In an interview Thursday, Wood neither embraced nor denied the possibility that sexism was behind the salary vote. But she suggested the question was worth exploring. Usually, she said, a full-time mayor receives the same increase as full-time city employees. Saying the vote had “raised some questions," Wood noted she had also suggested four highly qualified female candidates for positions as department directors with the city, whose appointments were also opposed by the same four council members who blocked her pay raise. The mayor said she also was “surprised” by the outraged response of the male council members to Bynum’s comments. Bynum did not immediately respond to a request for comment Thursday. Councilman Shane Siwik lashed out Thursday at the suggestion of sexism, saying it was “a desperate attack when you lose an argument to label somebody a bigot after the fact. Siwik also defended the rejection of several of the mayor’s appointees, saying in one case, council members lacked confidence in the person’s experience, and in another, the candidate was married to a former council member. The council and mayor have had several run-ins in recent years, including allegations of nepotism and mixing of politics and official business in City Hall. Two of the councilmembers — Siwik and Mark Kindred — challenged Wood during last year’s election, with Wood pulling out a narrow win over Kindred.